Coming up with ideas for All Saints Day costumes should be fun, not stressful! 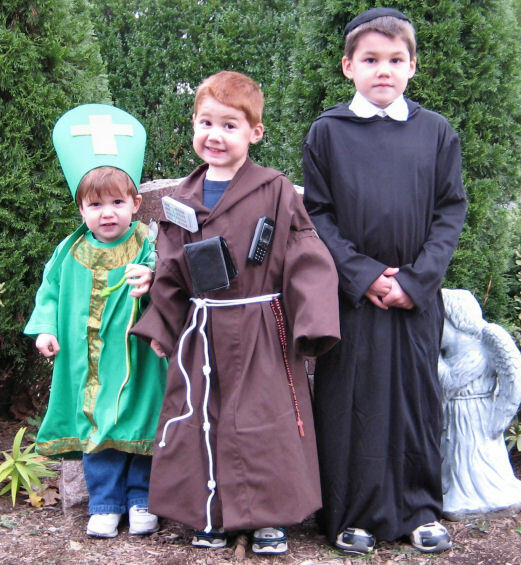 Don’t make your kids skip the All Saints’ Day party because you’re afraid of coming up with costumes. You do NOT need to know how to sew to pull it off. This post includes more than 60 ideas for boy saint costumes! Most saint costumes are going to start with a basic robe. One way to make a simple robe costume is to take a piece of fabric, cut a head hole in the top, put it on the child and tie a rope or piece of fabric around the waist. You can also wear solid colored clothes and then safety pin a sheet around yourself. For smaller children, cut a head hole and arm holes in a pillow case, place over them, and tie a rope around their middle. Wear some sandals. 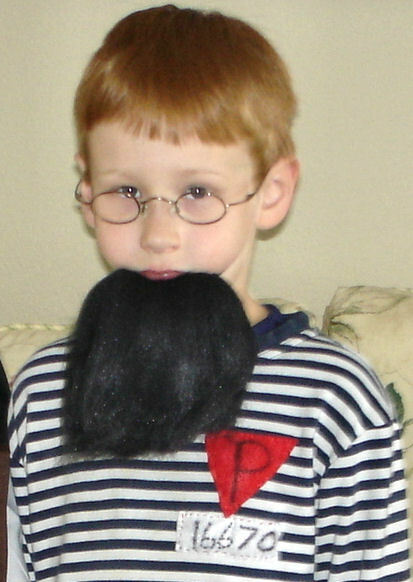 Many boy costumes can have a beard. 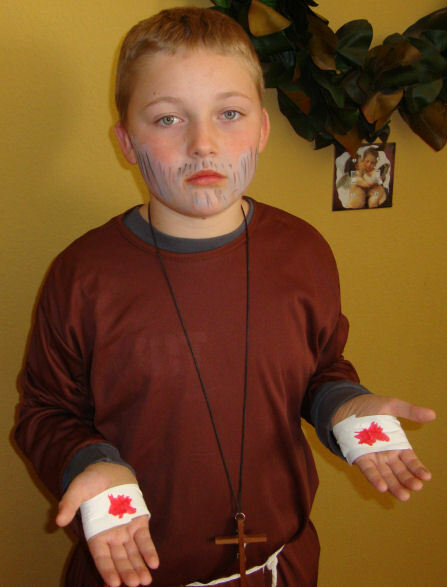 You can either use a little face paint to draw one on, buy a fake beard, or click here to see directions on how to make a beard yourself. Saints Who Wore Armor– You can easily find plastic armor at stores around Halloween time, or you can make your own. Just cut your armor out of cardboard, hold together with duct tape, and cover in foil. I love this idea to create helmet armor by covering a bike helmet in aluminum foil. Here are some great tutorials for making cardboard swords, paint stick sword and pizza pan shield, and a paper mache shield with a cross. St. George– Dragon slaying saint. Very superhero. If you want to wear armor, but not wings or a crown, this is your guy. St. Michael– Archangel. Wear armor, carry a sword, and you’ll need some wings and sandals. St. Longinus– Roman soldier with a spear. Here’s a great tutorial on how to make a cardboard Roman soldier helmet. Also, see the section on “Royal Saints” below. St. Edward the Confessor– Son of King Ethelred III. St. Henry– King of Burgundy. Wear a red cape and crown, and carry a sword. St. David– Prince of Wales. St. Wenceslaus– Red cape, armor, and crown- this guy has it all! St. Louis IX– Carry a scepter. St. Canute– King of Denmark. St. Ferdinand III of Castile– Armor, sword, and crown. St. Stephen– King of Hungary. 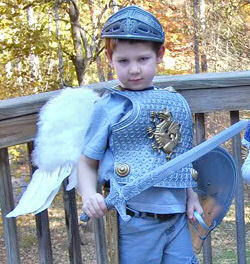 Archangels– I think St. Michael is one of the most common All Saints’ Day costumes I see, and why shouldn’t he be? He’s awesome! St. Michael– See above under “Saints Who Wear Armor”. St. Gabriel– Carry a horn. Brown Robes– These costumes start with a brown (preferably hooded) robe, a rope around the waist, and sandals. All the Saints who were Franciscans will dress pretty much the same, but can have different props. St. Francis of Assisi– Franciscan, brown robes. Find directions here on making a St. Francis hairpiece. Safety pin some stuffed animals around your robe, or a bird on your shoulder. St. Anthony– Also a Franciscan. Patron saint of lost objects, so tape commonly lost objects (such as keys and tv remotes) around your robe. He if often pictured carrying the Christ child, so you could alternately carry a baby doll or little sibling. He has the same tonsure haircut at St. Francis. St. Anthony the Abbot– Carry a crutch and a book. St. Rocco– Carry a stuffed dog. St. Pascal Baylon– Carry a chalice and a host cut out of card stock. St. Benedict– Pin a stuffed raven to your costume. red marker. We’ve also made them with white cloth and red food coloring. Priests– A priest costume can be easily put together by using some black pants, and a black turtle neck. Just tape a white square of paper onto the collar (or use a square of masking tape) and welcome to the priesthood! The colorful robes that priests wear on top would be optional for a costume. You can make priest vestments from sheets, or even cloth napkins! he was younger, so you could actually wear armor if you wanted. St. John Bosco– Also generally pictured in black. He loved to juggle! Carry 3 balls. Black robe with a white shirt over the top and a green sash or scarf over your shoulders for his stole. Add crosses to the stole by hot gluing ribbon, or sticking on pieces of yellow electrical tape. St. Jose Maria– Wear glasses. St. Francis Xavier– Black robes. St. Vincent de Paul– He wears black robes and a black skull cap. You can find directions for making a skull cap out of paper here. These could also be made from felt. St. Francis de Sales– Carry a sword and a scabbard in the shape of a cross. St. Andre Bessette– Andre worked as a farmhand, shoemaker, baker, blacksmith, and factory worker. St. Martin de Porres– This little St. Martin de Porres is carrying a pair of play-dough scissors because St. Martin was a barber. Bishops– To make a bishop costume, see the links above for making priest vestments.Then add a bishop hat (miter) and a staff if you like. 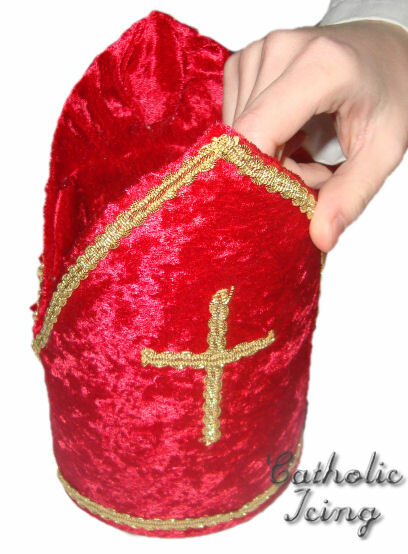 Find some great directions for making a paper bishop or pope hat here. I also love these colorful paper mitres. My friend actually made the bishop hat on the left by gluing fabric around an oatmeal container. She then added a piece of elastic for under the chin. St. Blaise– Usually pictured in purple. Carry 2 candles. I love this little St. Blaise costume. St. Nicholas– Wear a white beard and carry a little sac of chocolate coins. In a pinch, wear a Santa hat and a red sweat suit. St. Athanasius– White beard, carry a book. St. Valentine-Wear red and carry a heart. St. Ambrose– Carry a bee hive or a toy bumble bee. St. Gregory of Nazianzen– Carry a book. 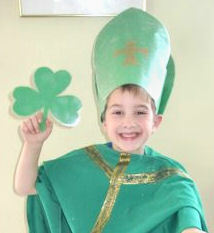 St. Patrick– Wear green, and carry a shamrock. Cardinal– St. Charles Borromeo– Wear a red robe and skull cap.You can find directions for making a skull cap out of paper here. This could also be easily done with felt. Popes– Dressing like a pope will look an awful lot like dressing like a Bishop. See tips for that above. Also, some popes like to wear red shoes. There are lots of saints who were popes, but here are a few. Blessed Pope John Paul II– Carry a big crucifix on a stick. St. Gregory II– This guy wears a really fun hat! Pope St. Gregory the Great– Patron saint of popes. Apostles/Biblical Saints– Start with a basic “robe” costume with a rope tied around your waist, and wear sandals. Here are 2 easy techniques to make a headdress. St. Joseph– He was a carpenter. Carry a hammer and ruler on your belt. St. James or John– Carry a string of fish or a fisher’s net. St. John the Baptist– Wear fur and carry a cross and a shell. St. Phillip– Carry a cross or loaves and fish. St. Andrew– Carry a “St. Andrew’s Cross“. St. John– His symbol is an eagle. St. Paul– Carry a sword and a book. St. Mark– His symbol is a winged lion. Pin a Lion stuffed animal onto your robes. You could even cut your lion some wings out of paper and tape them on. St. Jude– Carry an axe. St. Dominic Savio– Often pictured in a suit with a bow tie. St. John Berchmans– Patron of Altar Servers. Prisoner– St. Maximilian Kolbe, prisoner from Auschwitz. Wear striped pajamas, a beard, glasses, and a prison ID tag. Mexican Indian– San Juan Diego. Check out how to make a simple tilma out of a paper bag. Or check out my directions on how to make a San Juan Diego costume. Wear a sombrero and carry roses. If you have a sister, it would be great to pair this costume with Our Lady of Guadalupe! Firefighter– St. Florian. You can put together an easy firefighter costume by putting strips of duct tape and electrical tape around the bottom of khaki pants. Add some red suspenders and a hat- you’re ready to go! Viking Pirate– St. Olaf. So if you have a viking costume or a pirate costume, you’re ready to go. Farmer– St. Isadore. A farmer costume is easy to throw together at the last minute! Denim? Check! Plaid? Check! St. Gerard Majella– Carry a bible, skull, and/or crucifix. St. Thomas More– Make a simple hat out of paper.Find some great ideas for putting together a St. Thomas More costume here. Sacred Heart of Jesus– White robe, red cape, and sacred heart image taped to your chest. St Jerome– Carry a stuffed lion or pin it to your costume. St. Thomas Aquinas– Carry a book and a feather. St. Sebastian– Cover yourself in arrows. St. Dominic– White robe, black cape. Thank you to everyone who contributed pictures to this post, especially The Cotter Family, Dawn-Marie, The Helgoths, Tiffany, Elizabeth, Amanda, and Roxanne! Now Check out my Ideas for Girl Saint Costumes! 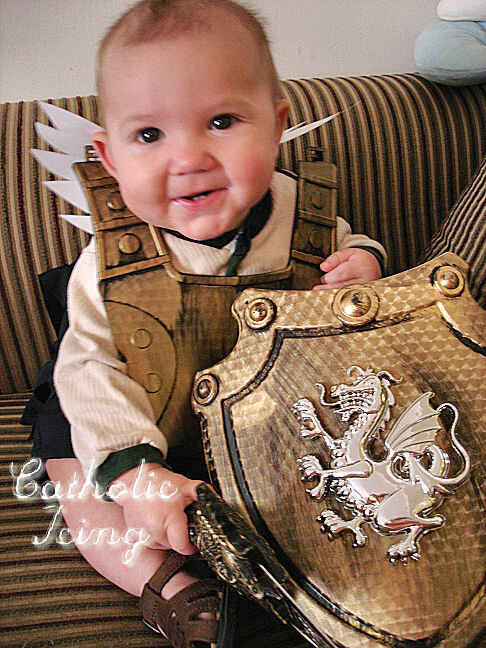 Do you have any ideas on what to do for a Saint Christopher costume? HELP. Thanks.